Recently I read a book titled Invisible Women Of Prehistory: three million years of peace, six thousand years of war by Judy Foster with Marlene Derlet . Both the text and drawn illustration were made clear by accompanying charts, classifications and time lines. The author/artist Judy Foster drew clear, concise and instructive drawings. 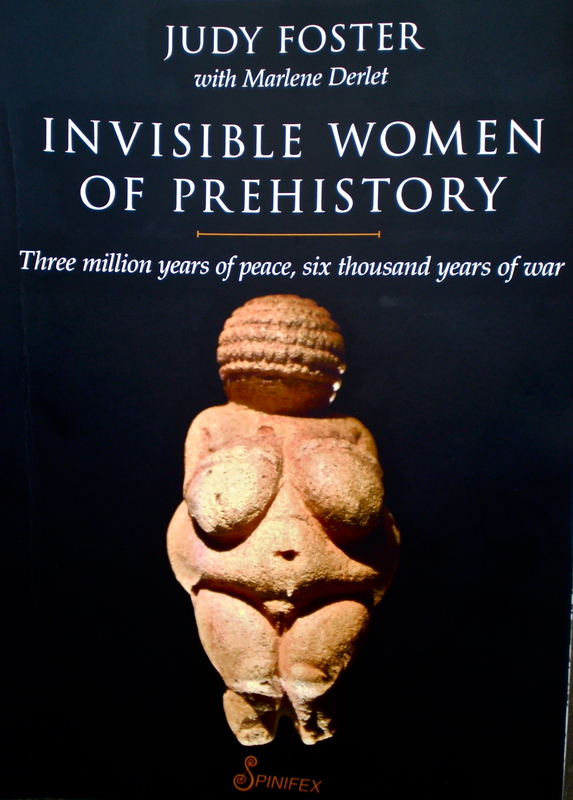 Invisible Women of Prehistory: three million years of peace, six thousand years of war by Judy Foster with Marlene Derlet. Spinifex Press. (front). 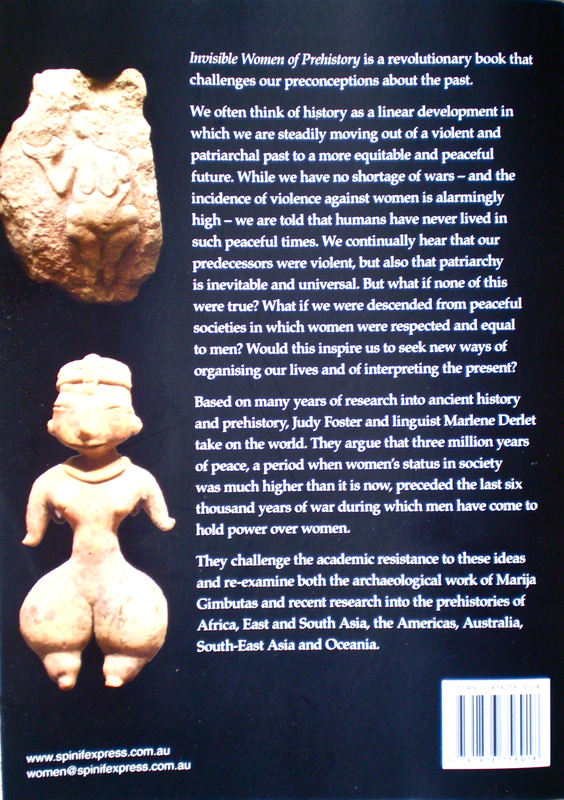 Invisible Women of Prehistory: three million years of peace, six thousand years of war by Judy Foster with Marlene Derlet. Spinifex Press, (back). The authors give the reader an encyclopaedic overview of the many archaeological finds in the form of sculptures and imagery found on artifacts, figurines, ceramics, tools and on walls of prehistoric sites where female imagery is predominant. Throughout this world-wide survey the authors argue that society and civilisation were more gender balanced and that women invented agriculture, pottery, writing, and textiles in prehistory, were not war-like and that this was a universal phenomenon. However this benign situation changed when Indo-European invaders ushered in a different type of ‘civilisation’. Europe during this time span was not the only site of excavation where this imagery was found. So it can now not be seen as an anomaly. Scenes of physical and psychological violence were generally absent and women’s status appeared to be higher than that at present. They challenge the academic resistance to the work of archaeologist Marija Gimbutas. Also challenged are ideas that the system we now live in has progressed from a past seen to be violent and brutal to the peaceful present. Many contemporary artists, from the 1960s onward, (influenced by aspects of these theories, accompanying images of archaeological sites and imagery found in and around the sites and excavations), sought different ways to subvert and go beyond some art historical sexist depiction as well as some contemporary imagery. On another level I thought significance also lay in challenging the perception of woman as minority which can lead to attitudes where Women’s rights are sometimes not understood as Human rights. In this way perceptions of the past can have ramifications for the present. As an artist I try to understand and explore origins and meanings encoded in imagery whether they relate to figure or landscape and this book will be a very handy reference. Categories: Preliminary photographs | Tags: archaeology, prehistory, Women's history | Permalink.